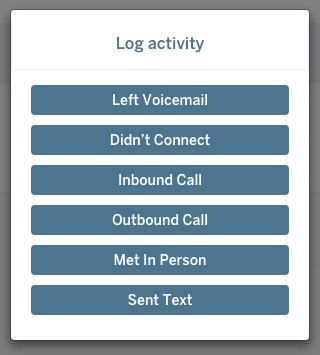 You can log activity, such as calls and meetings, with contacts, companies or opportunities in Spiro. 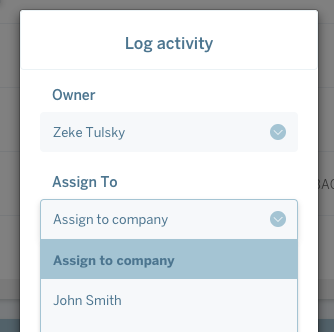 After you choose the type of activity, be sure to choose "Assign to company " or "Assign to opportunity" from the drop down to associate the activity with the company. The activity will record on the timeline. Next to each contact in Spiro, you will see different ways to interact with a contact: Call/Text, Send Email, Set Reminder, Log Activity. Logging activity for your key contacts associated with opportunities in Spiro is important because it helps to maximize the recommendations provided by your Spiro Assistant. 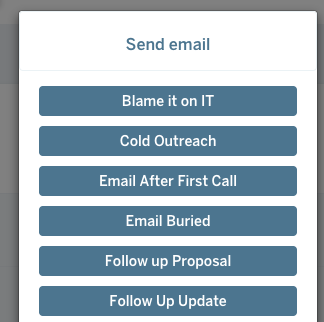 This action will pull up your email templates in Spiro for fast and easy outbound emails. You can create email templates under settings. Set reminders so you Assistant can remind you when to follow up with contacts in Spiro. Reminders will populate in your Assistant on the date they are due. This action will allow you to log several types of activity for outbound correspondence. 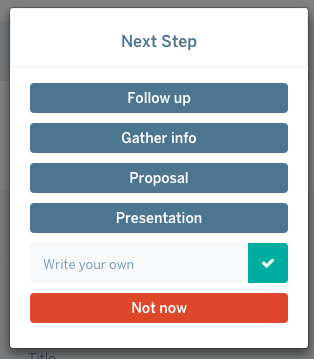 When you log activity, you will always be prompted to set a reminder or next step. All the activity you log in Spiro will populate on the Timeline which is a history of your past interactions with contacts. You can filter the timeline by type of activity, date, and owner. You can also add notes and attachments to the timeline using the icons on the right-hand side.